With a total of about 128 hours of exposure, this is a rather deep image of a huge are of the sky, mostly void of colorful nebulas, but packed with literally hundreds of galaxies in sight, many of them appearing so small they can be easily confused with stars. 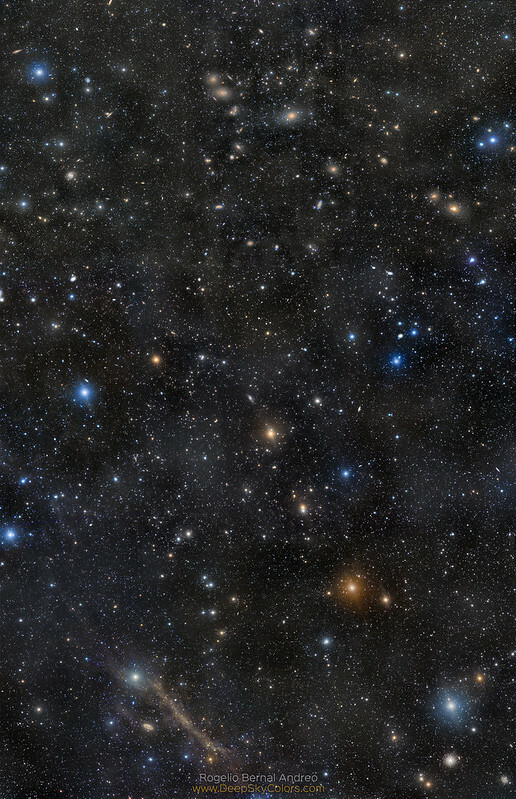 You can find most of the galaxies in the top 1/3 of the image , including what's known as the Markarian's Chain, a stretch of galaxies part of the Virgo Cluster. Still, tiny galaxies spread all over the image. Remember, each of those fuzzy dots is home to billions of stars and who knows what else. In the lower 1/3 of the image, to the left we can see the Blackeye Galaxy (M64) right under a stream of galactic cirrus clouds never imaged before like this until the image of this area I published a few months ago. At the bottom-right corner, globular cluster M53, right under the blue giant star Diadem, wants to be in the picture.